Supplies: Lawn Fawn “Wish You Were Here” stamps and dies, Hero Arts “Frame” die, Studio Calico Paper “Here +There”, Hero Arts Note card, Hero Arts inks, Memento black ink, Copics, jute, tiny clothespin, corner chomper, foam adhesive & sewing machine. 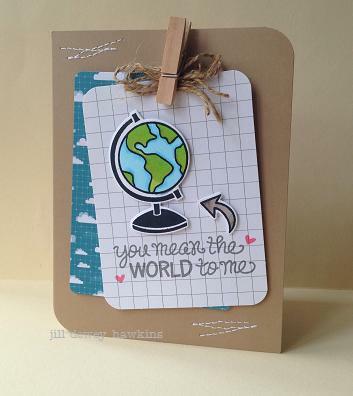 Anywho—I like the mix of using these stamps with a “sweeter” color palette…softens them, don’t you think? Love how that works. I fussy cut out a few triangles to add a little interest, but otherwise kept it pretty simple. I inked the card base to match perfectly. 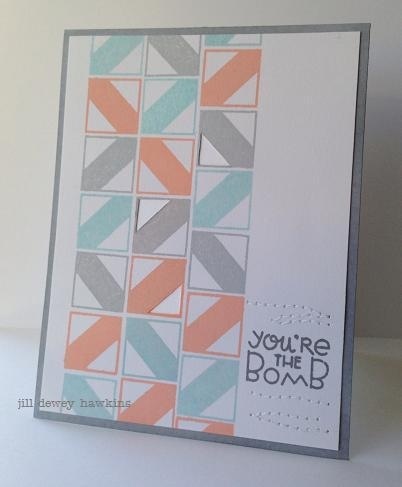 Supplies: (Design Motifs, Slang Gang) Paper Smooches, (Soft Cantaloupe, Soft Pool, Soft Granite, Charcoal) Hero Arts Dye Inks, (Snow Layering Paper) Hero Arts, Card base: Michaels heavy weight cardstock.